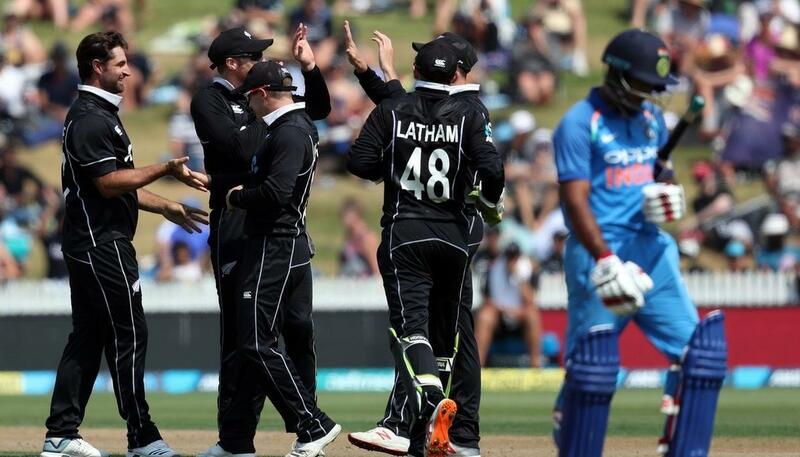 The Indian batters, who have been over the years known for creating and breaking records, for once did the complete opposite during the fourth ODI against New Zealand at Hamilton. Having taken an unassailable 3-0 lead in the five-match series, the Men in Blue were battered and bruised as they lost to Kiwis by eight wickets. While the defeat was surely a blip on their recent sensational run of form, the manner of their loss in the fourth ODI was appalling to say the least. The Virat Kohli-less Indian team were bowled out for a mere 92 in the first innings, with Kiwis chasing down the target in less than 15 overs. 212: This was India's worst ever defeat in terms of balls left. Previously, Men in Blue's worst defeat with balls remaining was 209 against Sri Lanka in Dambulla in 2010. 92: India were bowled out for 92, which was their lowest-ever score in ODIs in New Zealand. Their previous lowest score against Kiwis in their own backyard was 108 in 2003. Further, this was the seventh-lowest score for the Men in Blue in ODIs. 35: The top-six of Indian batting only managed 35 runs among each other against New Zealand in the fourth ODI, which was the second lowest-ever for the Men in Blue. Their lowest came against Sri Lanka in Dharamsala in 2017. The Indian batsmen, who have been really good in the series, were left bamboozled by the brilliance of Trent Boult. He was sensational early on, as he got rid of the openers Shikhar Dhawan and stand-in skipper Rohit Sharma. Things got better for the Kiwis, when Colin de Grandhomme joined in the action and got rid of Dinesh Karthik and Ambati Rayudu in quick succession. Boult, continuing from the other end, made things better for the hosts with the wickets of Shubman Gill and Kedar Jadhav to leave India stranded at 35 for 6. Despite some brave effort by Hardik Pandya and spin duo of Yuzvendra Chahal and Kuldeep Yadav, India were bowled out for just 92 in 30.5 overs.